The NJMPF drives inclusive, transparent, and sustainable practices through innovation and financial literacy. Law makers globally and international regulatory institutions exert a certain amount of stringent authority over financial institutions, particularly retirement funds because of the funds they hold. Whether these laws reduce or add value for stakeholders, the general perception is that as laws change and become more stringent, costs also escalate, and room for innovation and creativity is in some instances reduced. One organisation is leading the pack and offers a global example of what is meant by superior service. The Natal Joint Municipal Pension/ Provident Fund (NJMPF/Fund) is recognised globally for excellence in governance, investments, treating customers fairly, financial literacy programmes and best practices in retirement funding services. 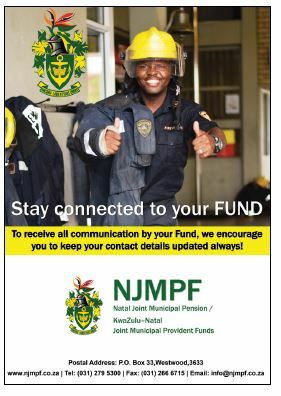 The NJMPF is a not for profit organisation, which provides retirement funding benefits for municipal employees in KwaZulu-Natal. These employees are employed at 55 municipalities in the Province. The NJMPF's vision is to provide superior retirement services and benefits to the 20 000 active members and 10 000 pensioners and beneficiaries making up its membership. There are several surveys published in South Africa and worldwide on the state of the population's attitudes and readiness for retirement. The results have tended to be consistent. For example, a survey conducted of South African households some time back was performed on a representative sample of 65-year olds. The following facts were uncovered; 47% were dependent on relatives, 31% were forced to continue working, 16% were dependent on a state pension, and 6% were financially independent. In recent studies, this situation has not significantly shifted perhaps due to inflation rates, taxation and cost of living increasing - Source: The South African Financial Planning Handbook 2018. Coupled with the above challenge is the issue of low financial literacy levels. According to a study by the Organisation for Economic Co-operation and Development (OECD), South Africa nears the bottom of the financial literacy class. The OECD/INFE International Survey of Adult Financial Literacy Competencies questioned 50 000 people aged between 18 and 79 and found that, on average, only 56% of adults across the 30 participating countries achieved a score of at least five out of seven, the minimum target score. South Africa barely reached the 30% score. In a retirement funding perspective, retirement funds should advance its core business objective, while simultaneously developing systems to enhance members and communities through creativity and collaboration without incurring excessive costs. This view that drives plans and projects, is motivated by team work, passion, strategic oversight, clear and proper communication and education, placing members at the core of decision making. The competitive edge for the NJMPF is providing superior service to stakeholders at low fees and ensuring high investment returns which increases members retirement benefits. Using technology to lower fees is critical for a retirement funding service and its members. Experts believe that as entities have grown and complexity, specialisation, silos, and ultimately hierarchy have choked off the capacity to readily adapt and innovate. Finding innovative ways to enhance and accelerate member participation in the retirement funding arrangement is important. The NJMPF is introducing a barcode ballot voting system for voting of the Board of Trustees. The NJMPF is among a few if not the only South African retirement fund to provide a barcoding voting system for the voting of Trustees. During 2016, the NJMPF introduced an interactive webpage to promote information sharing and during 2017, a mobile application was created to promote education and communication. Currently, the NJMPF teamed up with the National Credit Regulator (NCR) as it has recognised that within its own membership, members are burdened with debt. In collaborating with the NCR, the NJMPF has been able to offer its members and pensioners advice on debt and credit management from the experts (NCR) themselves. Partnering with the regulator allows for leveraging of expertise on credit/ debt management education and educating NJMPF members at no cost. During the past years instead of In the past years, the NJMPF has partnered with the Financial Services Board including the Office of the Pension Funds Adjudicator and the legal advisor to the Fund to educate stakeholders about issues relating to financial literacy. Investment performance is a key agenda for any retirement fund. The NJMPF has achieved excellent short and long-term investment performance which has enabled the Fund to increase and improve benefits to members and pensioners. Pensioners of the NJMPF are awarded increases and benefits which greatly improve their standard of living. The NJMPF has continued the tradition of obtaining clean audits from the Auditor General of its annual financial statements in an environment where clean audits are rare. This is an indication of the good corporate governance practices. Further, in ensuring the maintenance of good governance, the NJMPF has subscribed to the Institute of Directors King Code of Governance Principles. The NJMPF is complying with all principles applicable in the retirement industry.